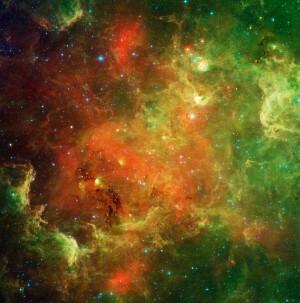 Tonight and tomorrow night – April 15 and 16, 2011 – are wonderful times to identify the ringed planet Saturn! The oval-shaped waxing gibbous moon is near the planet both tonight and tomorrow. It’s even closer to Saturn tomorrow than tonight. The day after tomorrow – on Sunday – the full moon will couple up with Spica, the brightest star in the constellation Virgo. Saturn is only a couple of weeks past its opposition on the night of April 3/4. On that day, Earth flew between the ringed planet and the sun, placing Saturn opposite the sun in our sky. In other words, in early April, Saturn was rising at sunset. Now, not even two weeks later, Earth has moved on in its orbit – placing Saturn just above the horizon when the sun goes down. Around the time we pass between Saturn and the sun, the distance between Saturn and Earth is least. That’s why this is such an excellent night to see Saturn! It’s now approximately brightest for the year. Saturn – the ringed planet – is the gem of the solar system. Usually, this world’s glorious rings can be seen quite easily through a small telescope. Saturn is the solar system’s second-largest planet and the sixth planet outward from our sun. Remember the number 9.5 and you have Saturn’s vital statistics at your fingertips. Saturn’s diameter is about 9.5 times greater than the Earth’s diameter, and Saturn lies some 9.5 times the Earth’s distance from the sun. Now back to the moon. Why does the moon change partners from night to night? The fact is that – every day – the moon travels about 13 degrees eastward in front of the backdrop stars. The moon’s diameter equals about 1/2 degree, and your fist held at an arm length from your eye spans roughly 10 degrees of sky. The moon’s motion from night to night is due to its actual motion in orbit around Earth. Although the Earth’s rotation causes the moon and stars to drift westward across the sky throughout the night, the moon’s orbital motion continually propels the moon eastward through the stars over the course of each month. So watch the moon tonight and tomorrow night. 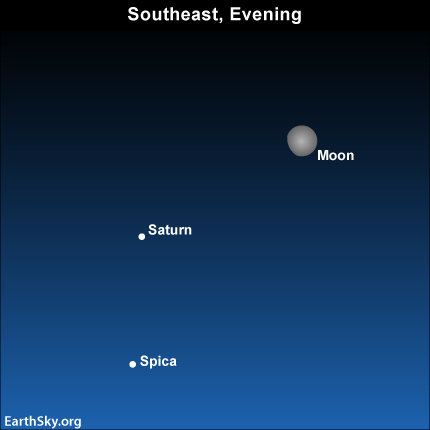 Almost all night, the moon can guide your eye to Saturn, which is now approximately at its best and brightest for the year.